The 49ers are the biggest mystery in the NFL. They were bad for nine weeks last season. They dropped passes, missed assignments on defense and generally played like the worst team in the league. They couldn’t win. They began the season 0-9. Then, they traded for Jimmy Garoppolo, and won five games in a row. For a little more than a month, the 49ers couldn’t lose. They even beat the Jacksonville Jaguars by 11 points, and that team went on to the AFC Championship Game. Garoppolo changed everything for the 49ers. He was magical. Now, the 49ers don’t know which team they are, although they hope they’re the team from the final five games of last season. They don’t know if they’re good, bad or mediocre. They could go to the Super Bowl or finish last in the NFC West. Both predictions are entirely possible and plausible. So much is unknown about them. 7. Jed York sells the 49ers. #3. Everyone keeps harping on McKinnon. When fans and reporters do it . . . well, who cares? When coaches do it, it’s concerning. Why would you want to design your whole offense around an unproven commodity? Correction; a proven . . . well, bust. If he’s so good why did his ole team just not want him. He was totally “meh” as a running back. “Scheme” you say? Well, he’s an unknown there as well. Hasn’t done it in a game. He’s hopeless as a running back, so defenders are going to ignore that, and focus on him as a receiver. He has no wiggle. Goes down when touched. Great in the weight room, but the game isn’t played in the gym. Besides, there’s no telling; Breida may be better than McKinnon could ever be. There’s not the big sample size there is on McKinnon. Shanahan says that he’s light years better than last year and he was decent then. Looked like a better pure runner than McKinnon. Too bad that McKinnon did go down. Luck for him, in a way. I was betting that Marris was going to prove a much more valuable contributor to the team than McKinnon was. Now we’ll never know. Now McKinnon gets to sit back, collect his paycheck, pout, and make like he was going to tear up the league. Nice gig. Laughing all the way to the bank. #4. Doing the same old, same old on defense and expecting different results is taking a big chance. Shanahan looks like he pays little attention to the defense. Of course, he doesn’t know defense and so has to rely on others. We know that the FO (read General Manager) is incompetent at pretty much everything without the coach’s direction, other than mouthing off sound bites and trying to sound important . . , so no help in acquiring the necessary expertise from that office. Because no one has done anything about trying to bring in some decent coaching leadership on that side of the ball. The DC is in over his head. What are the Niners thinking? Yup, it’s really all on Jimmy G. Better be up to it, young fella. It’s going to be interesting to behold. Eff1, good points, unless of course, you actually know talent when you see it. When you’ve been watching football as long as some of us, you don’t need statistics in order to tell if someone is a natural pass catcher. McKinnon is a natural pass catcher, Breida is not. It’s not rocket science dude! I’m sorry you aren’t able to use your eyes to see the difference. Maybe you should stick to reading the box scores rather than actually using your eyeballs to watch the games live. What a stupid comment! Believing someone could coordinate the NFL’s number 1 scoring offense (Atlanta Falcons 2016, 33.8 points per game), without understanding NFL defenses (He [Shanahan} doesn’t know defense = dumbest comment EVER), tells me you should probably look for a different sport to comment on. Just saying! At the 5:05 AM mark, were just a few hours away from getting some answers–at least a peek at what the early season will bring. All the draft, training camp, and preseason hair-on-fire reactions are past. Now, what’s real and what isn’t. Gonna be fun! PS…. Does it still matter what Solomon T. weighs? As long as the locks don’t refuse the keys, we should be alright. Referring to your mommy? It’s like throwing a hot dog down a hallway! I posted something similar prior to reading this column. 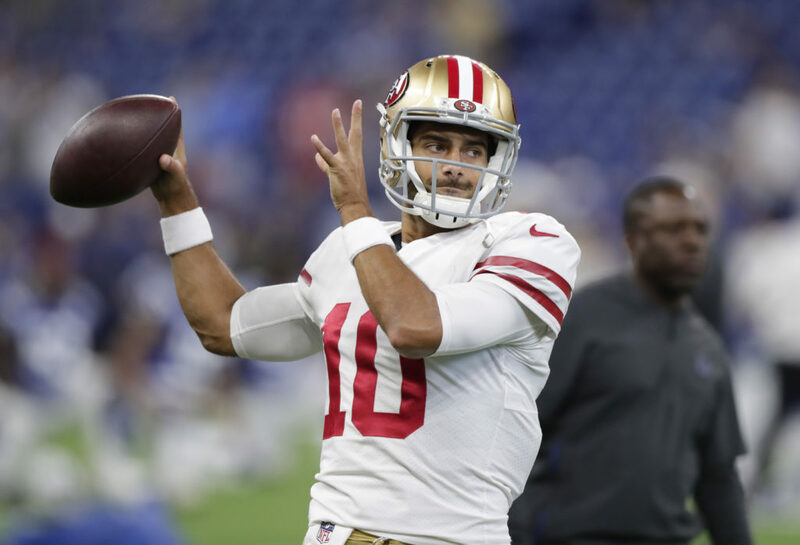 I think Jimmy G is very good though he still will make some concerning throws. He’s still somewhat of a question mark. Having said that, he is still gives the team it’s best opportunity to win. He has great competitiveness and attitude. Indispensable in that position. 49ers should’ve got Kirk Cousins. Blew the season already. I predict a sobering game for Jimmy G. Watch our offensive line be truly offensive and blow assignments all day. Poor guy can’t do it all by himself and the talent level, especially on defense will make this an 8-8 year. Plus side? We’re just getting started! Look for this team to seriously contend in 2 years as the defense is shored up. Go 49’s! I think they’re closer to mediocrity myself. I don’t know what to expect this year. Mediocrity certainly is a viable position. be revealing in the positive … and as such .. If we win we win by 10. If we lose we loose by 14. Now that it’s Sunday, I’m thinking 9ers 26, Vikes 20. Does it? Realistic speaking? I don’t see the Patriots, Rams, Eagles, Vikings, Saints, Steelers, finishing last in their division. Well the good news is that the media and all the hyped-up experts settled down on the “hype” from earlier in the off-season and began to forecast this team as a middle-of-the-pack, just out of the playoffs team. The pressure to perform was lifted before game 1. Now they just need to go out and execute. Keep games close and I think this year we win those close ones. Game day homies! Let’s do this! I’m a little nervous too. But I feel we should be optimistic with the progress the team has made to this point. We will see how these first games go. I think that Shanahan will ATTEMPT to plug Breida into some of the packages/plays designed for McKinnon and give Breida the opportunity to do or die. We will know pretty quickly when Breida is sent on wheel routes or goes in motion out of the backfield and comes off the LOS. The two WAY bigger concerns are the O-line protecting Garrapolo and the D-line generating some kind of pass rush. Those two things are going to be the biggest factor in determining how this season goes. If we cant protect Jimmy this is going to be a very long and disappointing season. +1000 Cassie. #6 would be great but most likely unachievable. :) Just do what I do Cass and enjoy the comedy. After experiencing several decades of Bay Area football–NFL and college–I’ve learned to take things as they come. Sure, I have my emotional ties–I want to see wins and championships, the more the better. It was well into the 1996 season that I decided to ease up some. From the late 60s until then, I hung on very tightly to every draft, every camp, every roster move, every quarter, every win and loss. The highs were incredible, and the lows were devastating. Enough already. Too consuming, too draining. I’ve been having much more fun around football since, and those close to me find me a bit more sane–especially on game day. Wonder if Darren5000 will make his/her appearance today? Excellent piece Grant. I concur on all accounts. Now, it’s time to play football! Minn 31 SF 23…. we lose because of redzone ineffectiveness and unforced errors. Whoa two Achilles surgeries? I thought it was one Achilles and bone spur removal on the other foot. Coulda sworn Sherman saying that in dispute of the reports. We are better across the board at every position except RG and Edge rush. But Buckner will dominate at edge rush just like Calais Campbell did last year.